Monday to Friday, 8.30 am from April 01 2019 until September 30 2019. During this time, the computer pool closes at 9.30 pm. Monday to Friday, 8.30 am from February 18 2019 until March 29 2019. During this time, the computer pool closes at 8 pm. The PC pool of the Computer Centre is located in rooms 218 and 219. It is partly supervised by Computer Centre tutors during opening hours. We will gladly help you if you need assistance or have any questions. The PC pool offers computer workstations with scanners and printers. There are also workstations for people with visual impairments and height-adjustable tables. 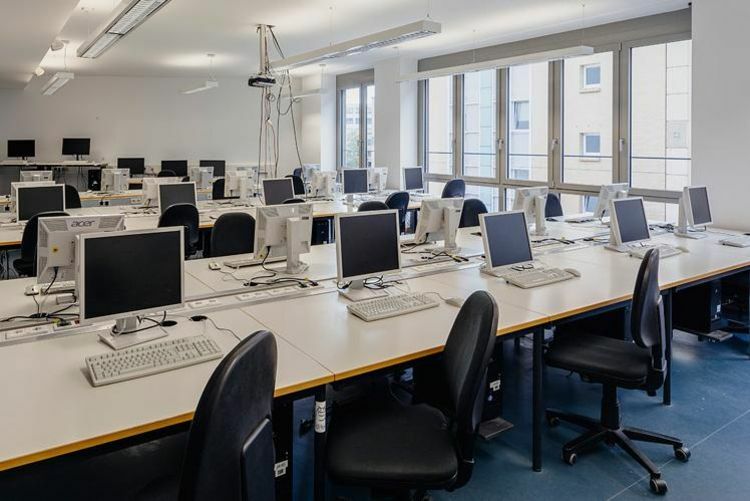 A total of 44 PC workstations are available for use. Outside of the Computer Centre opening hours, the workstations can also be used during the regular opening hours of ASH Berlin. Please see the porter and provide your student ID and personal identification document. Note: Credit for erroneous printing will only be granted in exceptional cases (technical errors, e.g. in billing). Empty toner cartridges and unwanted printer settings do not count as technical errors. Especially before printing large documents, we recommend that you check the current settings of the printer. It might be that standard settings were not used for the previous print job and will still be active for the next print job. We also recommend printing one or more test pages first. You can then check these pages for quality and format. This will enable you to correct any unwanted printer settings before printing large numbers of pages and empty toner cartridges can be changed by the tutors. Since winter semester 2016/17, Education Roaming (eduroam) has been available at ASH Berlin to all members of the university. Via eduroam, you can receive direct and simple Internet access at all locations of participating universities and institutions. Students who are already registered with eduroam can use this directly at ASH Berlin. Students who are not yet using eduroam can register with their ASH user ID. Step-by-step instructions for different operating systems can be found here: Instructions for other operating systems are available on the online help pages of the Computer Centre.